In order to set up a research base and research schemes, I carried out the following activities in Namibia. At the University of Namibia, I visited researchers, such as Professor Wilfred Haacke at the University of Namibia, Ms. Johanna Brugman from Cornell University and Dr. Thomas Widlok from the University of Heidelberg, in order to exchange information regarding anthropological research in Northern Namibia and discuss future collaboration through research. In addition, I visited Mr. FUJIOKA Yuichiro, an ASAFAS graduate student (year of enrollment: 2002), who has carried out research on the transitions of vegetation and tree utilization by Owambo agro-pastoralists, and then discussed the results and future plan of his research. Also, I engaged in archival research on the historical relationship between the San and Owambo (in the National Archives of Namibia), collecting resources about the ecological history of Ekoka Village in Northern Namibia (in the Ministry of Land, Resettlement and Rehabilitation), research on social migration among the !Xun and Hai||om (in Oniipa), and research on language socialization among the !Xun and Hai||om (at Ekoka Village, located in Northern Namibia). 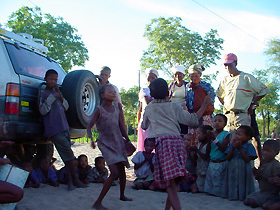 Caption: San children dancing at Ekoka Village, where the development project for the San is being carried out. In Northern Namibia, various cultures have interacted in complex ways and have thereby constituted the history of the area. Integrated research schemes with the collaboration of wider disciplines have been promoted through activities of the COE program to date. It is thus important to publish concrete results in the near future. Insufficient time was available on this trip for archival research in the National Archives of Namibia and Ministry of Land, Resettlement and Rehabilitation. Regarding the rich resources in these institutions, one of the remaining as future tasks will be to conduct a systematic survey of these archives.